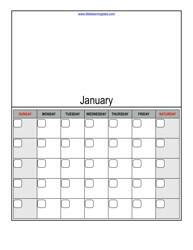 Learn your months, your dates, your holidays, and all kinds of things with these blank, fill-in-you-own calendars. Students not only get to fill in their own dates and special events, they also get to illustrate the month's picture. Each date box has a small rounded square you can use to put extra information in or you can write the day numbers really small in there, too. Download and look at the whole product for a long list of suggestions on the last page! Learn your months, your dates, your holidays, and all kinds of things with these blank, fill-in-you-own calendars. Students get to fill in their own dates and special events. 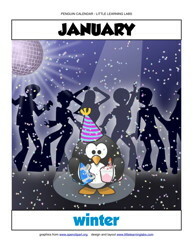 You can use the fun penguin-themed monthly pictures, too. Months, seasons, and 3-letter day abbreviations are filled in. The rest is up to you, so this works for ANY year!